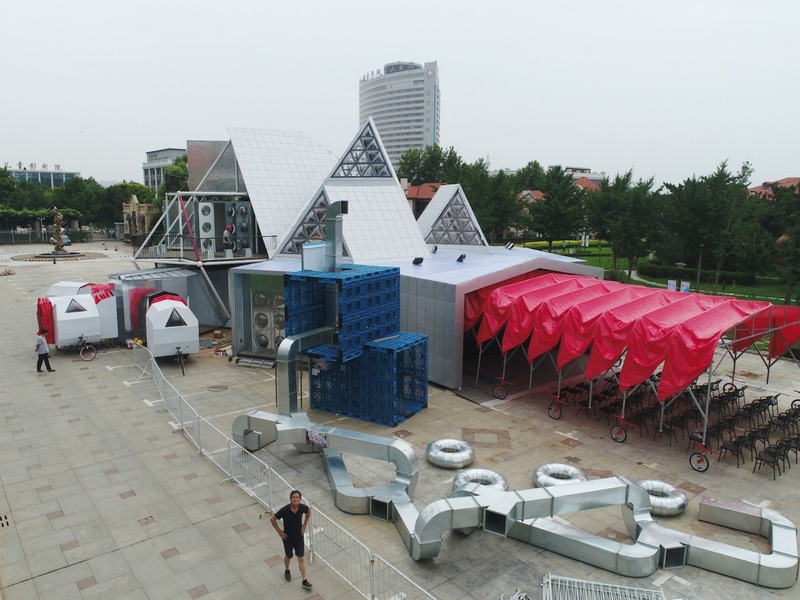 People’s Architecture Office just unveiled a futuristic cultural center in China that is equipped with detachable room that serve as “cultural satellites.” The incredible building – called the People’s Station – uses the flexible mini-structures to add extra space when necessary. 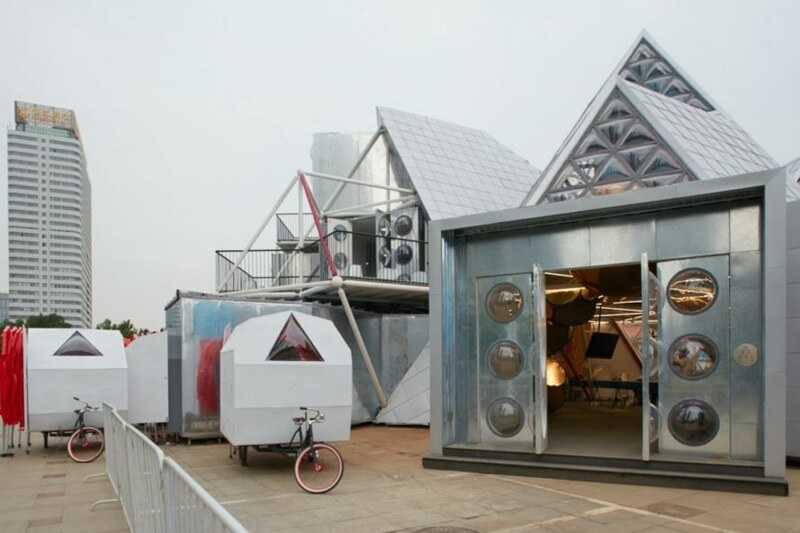 When not in use, the mini-buildings can be collapsed and transported by bike to other locations. The architects used their own prefabricated system to manufacture the building, which took just three months to construct. Located in a quiet region of Yantai, the building’s design was created to attract visitors to the historic center of the city. Its funky angular volume is comprised of wide open entryways and various sections that seem to float off the ground. On the inside, the exhibition rooms are the first two floors are expansive, with high ceilings that are staggered up diagonally up to the second and third floors. Triangular glass panels flood the interior with natural light. On the top floor, visitors can enjoy a lounge area with a bookstore and a cinema. Throughout the building, there are various outdoor terraces that offer beautiful views of surrounding cityscape, as well as the ocean in the distance. People's Architecture Office just unveiled a futuristic cultural center in China that is equipped with detachable room that serve as "cultural satellites." The incredible building - called the People's Station - uses the flexible mini-structures to add extra space when necessary. 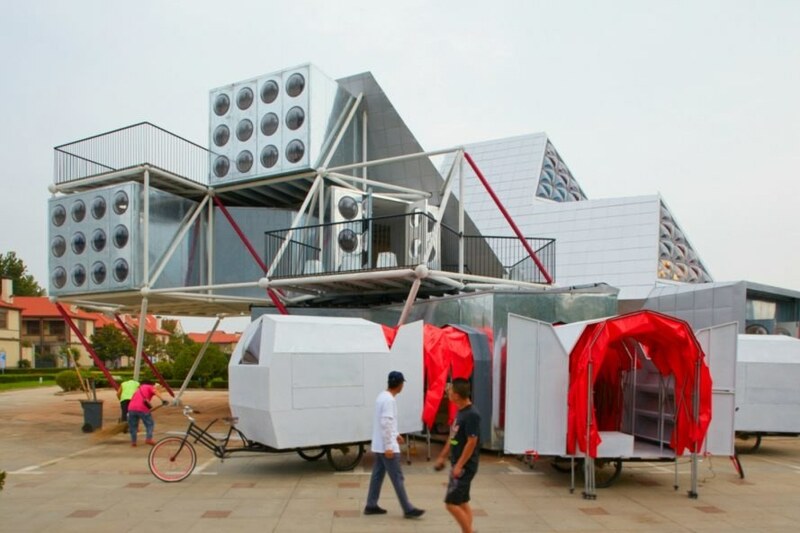 When not in use, the mini-buildings can be collapsed and transported by bike to other locations. The building took just three months to construct. 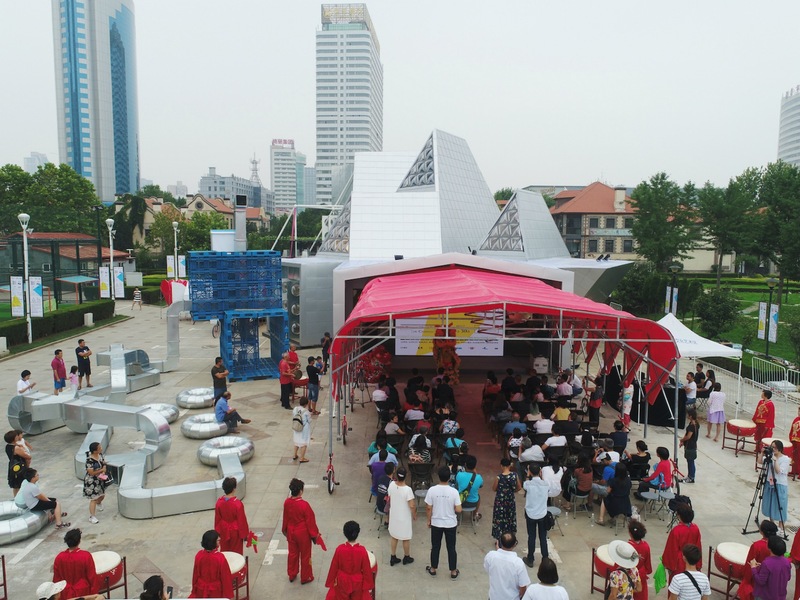 Chinese firm, People's Architecture Office have unveiled a futuristic cultural center in China, which is equipped with detachable appendages that act as transportable "cultural satellites." 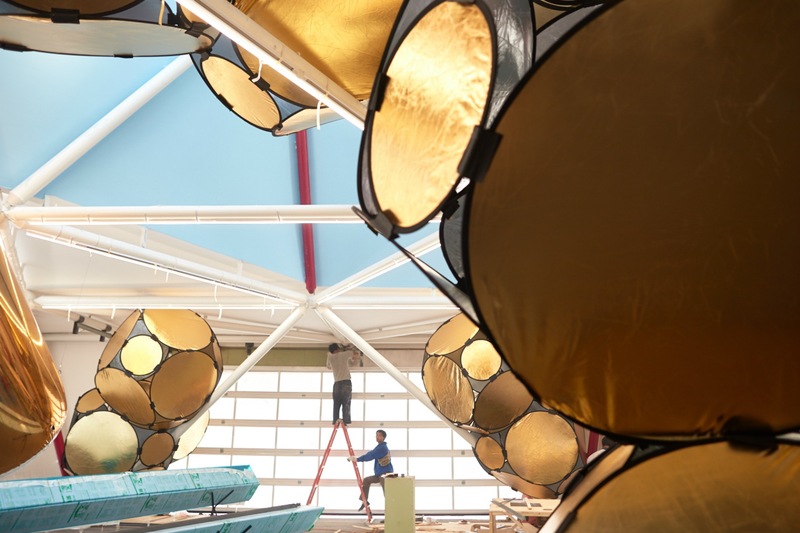 The incredible building - called the People's Station - uses the flexible mini-structures in an accordion-like manner, adding extra space when necessary. 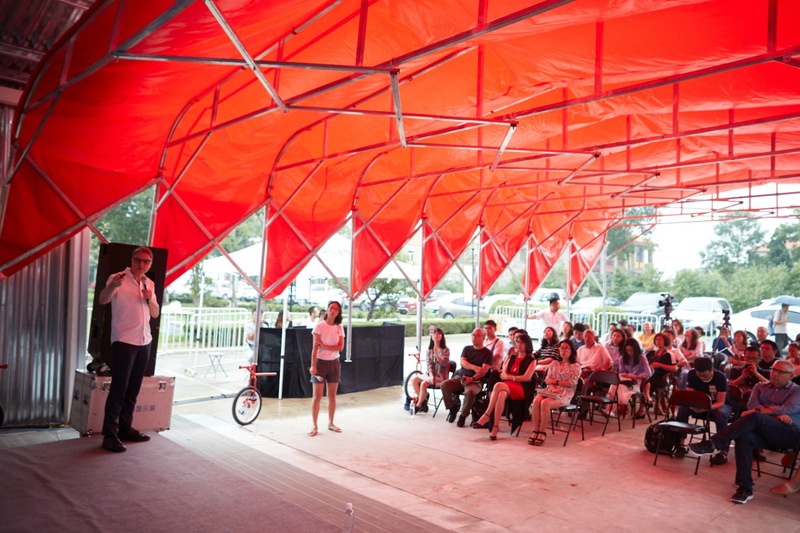 When not in use, the mini-buildings can be collapsed and transported by bike to other locations. The architects used their own prefabricated system to manufacture the building. Located in a quiet region of Yantai, the building's design was created to attract visitors to the historic center of the city. The buildling's funky angular volume is comprised of wide open entryways and various sections that seem to float off the ground. On the inside, the exhibition rooms are the first two floors are expansive. The center was created to bring tourism to the sleepy town. The interior was built with high ceilings that are staggered up diagonally up to the second and third floors. On the top floor, visitors can enjoy a lounge area with a bookstore and a cinema. Throughout the building, there are various outdoor terraces that offer beautiful views of surrounding cityscape, as well as the ocean in the distance. The accordion-like appendages add space to the building. The building is an angular form, with various pitched roofs. Triangular glass panels flood the interior with natural light. 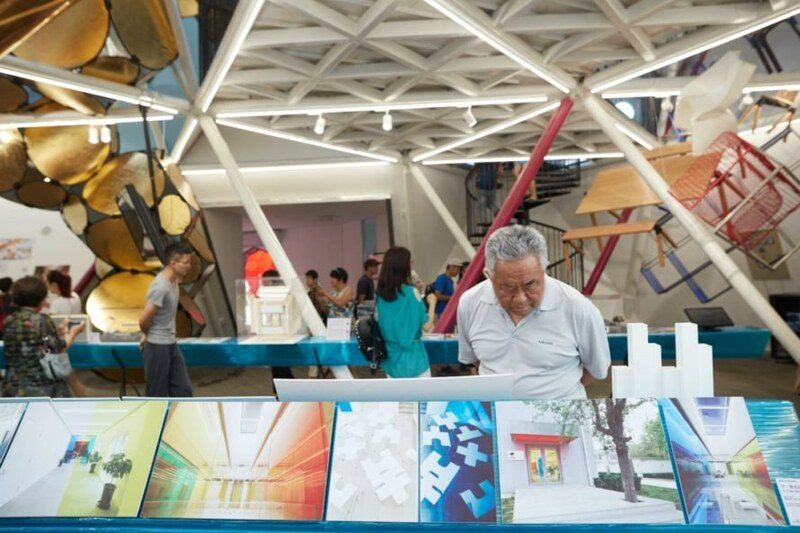 Inside, the exhibition space is flooded with natural light. The interior has exhibition space, a lounge and cinema. On the inside, the exhibition rooms are the first two floors are expansive, with high angular ceilings that are staggered up diagonally to the second and third floors. The architects used their own prefabricated system to manufacture The People's Station. The prefabricated structure took just three months to construct. The building's angular volume is comprised of wide open entryways and various sections that seem to float off the ground. The People's Station has a variety of indoor/outdoor spaces to use for year-round events. On the top floor, visitors can enjoy a lounge area, with a bookstore and a cinema. The People's Station designed by People's Architecture Office.